The Bertucci’s Italian Restaurant Survey, found at Survey.Bertuccis.com, is an online questionnaire designed by Bertucci’s Italian Restaurant that gauges customer happiness. This can allow improvements to be made throughout their stores, which helps them. This survey is done online for your convenience. If you want to help the company improve, you should take the survey. It’s in your best interest to help the company because they will in turn help you. If you have any problems while visiting, they can learn from those problems and make changes so that you have a better experience. They can also learn from your good experiences; it helps them to know that those areas work well. To thank you, they are offering something special; look on your receipt to find your special offer. Founded in 1981 by Italian entrepreneur Joseph Crugnale, Bertucci’s is a chain of fine dining restaurants specializing in Italian food. The first restaurant opened in Boston, MA and served only brick oven cooked pizzas with more unusual toppings such as eggplant, and artichoke hearts. The company grew during the 1980s and 90s, introduced take out service at some restaurants, and in the 90s began diversifying its menu. Today, there are just over 80 Bertucci’s restaurants, all serving a variety of traditional pasta, chicken, steak and seafood dishes. In 1989, USA Today newspaper voted Bertucci’s as one of the top pizza restaurant chains in the country. 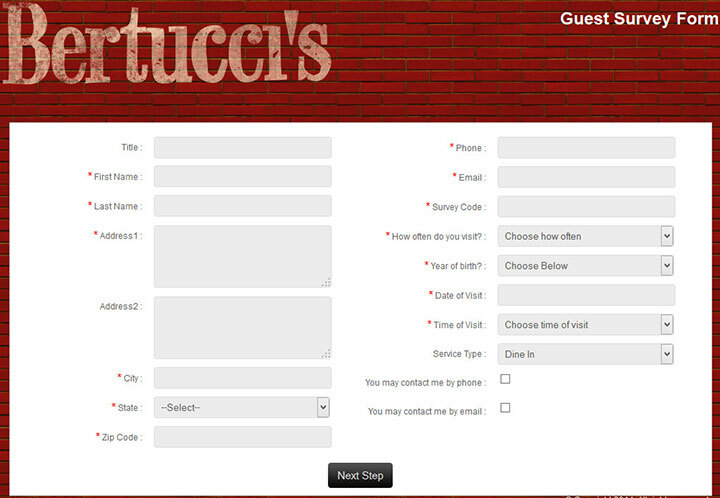 Have your recent Bertucci’s receipt that contains an invitation for the survey. Enter your first and last name, address, city, state, zip code and email address. You will then need to verify the email address by entering it again. You are not required to put in your phone number, but you can. Enter the survey code next, as well as how often you visit the restaurant. Next, enter your birthday, date of visit, time of visit, how you were serviced and whether you give permission to be contacted by either phone or email. Click Next when finished. Answer questions and receive a special $5 offer to use on your next visit.